If you are anything like me, then you find that one of the only reasons to love this blasted could winter time is because it makes eating all the best soups, stews, and chilis so much easier. Now, I’m not a big fan of traditional meat heavy chili for the most, but I do love the spicy flavors, the beans, the way it eats like a soup but fills you up like a big meal. I served my bowl up with extra cilantro because it is definitely one of my favorite herbs. 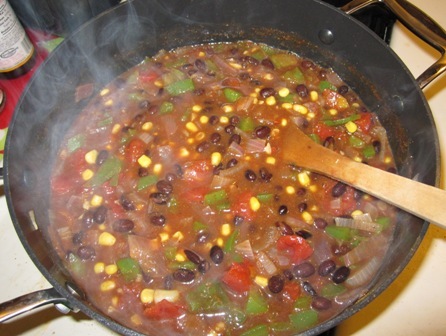 I’ve become a huge fan of black beans in the last year or so too and using them as the base really allows you to play with flavors your wouldn’t normally associate with chili. 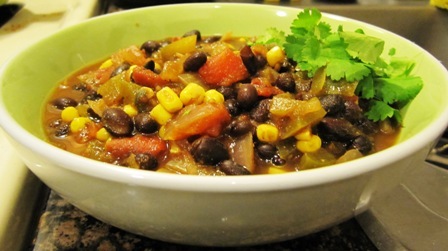 The cilantro and corn really rounds out the spices and makes this recipe so savory. It’s got a funky Santa Fe vibe to it that I love. One entire quarter (about 2 cups) is one serving and there is no need for sides and no reason to add anything to it – nope, not even cheese. This chili is perfect just the way it is. Cooking away in the pot. Heat 1 TBS broth in a medium size soup pot. Healthy Sauté onion and bell pepper in broth over medium heat for about 5 minutes, stirring frequently, until translucent. Add garlic, cumin, and red chili powder and continue to sauté for another minute. Add 1-1/2 cups broth and the rest of ingredients, except for the cilantro and corn. Simmer for another 20 minutes uncovered. Add corn and cook for another 2 minutes. Add chopped cilantro and season with salt and peppers to taste. As I’m not following Weight Watchers at this time, I do not know the points. But, I updated with the info I do have.